I've got comments on the "good enough" article saying that overgearing leaves room for error, so a mistake of a player does not cause wipe. It's true and one shall always leave safety margin. I wouldn't risk all my money on one investment, no matter how juicy it seems. And I would never ever play with negative safety margin: risking borrowed money. However safety margin is quantifyable thing and not a foggy excuse for wasting too much resources for a goal. Safety margin is exactly like insurance: you waste resources if everything goes smooth but you are saved from certain errors. Do you want to exclude the error? If you have enough gear to 9 man Patchwerk, you won't wipe if a melee DPS pulls aggro and gets killed. But do you really want this error to "disappear"? Or would you like to fix the error by teaching/kicking such DPS? Remember, safety margin is against unforeseen and random problems and not to handle usual problems. Does the planned safety margin exclude the error? People often sign bad insurance contract that protect them from flooding, earthquake in a land where such things are very rare, but does not protect them from wildfires what are more probable. Just because you have some safety margin, it does not mean you are safe. For example if the possible error is losing offtank to Patchwerk, overgearing the DPS does not help a bit. Bringing an extra tank or healer solves this problem. They are safety margins since they are "useless" when everything is OK, but prevent wipe when not. Does the gained error-exclusion worth the cost? It's simple mathematics. If chance_of_error*cost_of_error > cost_of_margin, than margin shall be formed, otherwise it's better to suffer the error when happens. For example demanding 2400DPS for being eligible to the 10 man Naxx raid defends the raid from wipe if one DPS DC-es. If people DC every 10th raid then chance is 0.1. The cost of error is 4G repair, 6G consumables and time lost that could be spent on a daily quest getting 10G. 20*0.1=2. I doubt if anyone knows anything that provides 400DPS for 2G. On the other hand if the group wipes 2-3x before kill every week because a tank dies, than the chance is around 200-300%. 20*2.5=50. Asking the DPS warrior, cat, retri paladin or DPS DK to put on tank gear and tank stance solves the problem, providing an off-tank when the primary off-tank dies. He will do 1000DPS instead of 2000, so everyone else must do 2200. For 50G I doubt one could buy 200DPS increase but if we count for weeks (you have to buy that enchant or BOE once) it can be profitable. In business the safety margin is mostly money not invested. Such money does not bring me profit, but lets me start over if my investments go south. These numbers vary by people, but they are numbers. You have to set them as numbers to avoid explaining everything as safety margin. After all "maybe one day I'll be on the highway when I hear in the radio that the terrorists planted a nuke in the nearby city, and in a Lamborghini I can get out of the blast radius and in a Toyota Prius I cannot, so buying a Lamborghini is a good idea considering safety". Logically correct. Still completely stupid. Don't be completely stupid! In WoW the costs of errors are very low. The ultimate disaster is the wipe and it still costs only a few golds. No need for wide safety margins. Gev, I think it's very revealing that as soon as you bring up the "good enough" theory, then people start raising the "but then you don't down the boss reliably" argument, and talking about the total time of the weekly raid, etc. Rationally this seems...wait for it...irrelevant, at least without filling in the missing gaps as we move from a single boss pug to a weekly guild type raid. But emotionally, this move is very telling. Once a set of bosses is down, people inevitably move to the viewpoint of aiming for speed and smoothness. The progression chain, from gaining levels, to downing new bosses, next moves to the swiftness and fluency that the raid displays in dealing with the challenges more easily each week. The step from people using this as their goal, and gaining satisfaction and fulfillment from achieving it, and then to coming up with reasons to see it as essential, is well understood. Maslow's heirarchy of needs, MMORPG style. Fulfill your needs, and your wants become your new needs. Do you see my point? I love your posts when you point out that other people are doing illogical things, and say what a logical person can do to take advantage of that. But when you try to convince other people to be logical in a case like this, it kinda misses the point. They are being illogical, on purpose. First comes the emotional response, then comes the pseudological justification that they slather all over it, like putting lipstick on a pig and then kissing the pig until the lipstick covers you instead. In this scenario, anger at your analysis comes not from emotion alone, but from suppressed emotion. If someone's guild is open about competing for dps because it's fun to play that way, then your analysis is just you feeling a different emotion. If someone's guild is about maximizing dps for some nebulous concept like the good of the guild, then your analysis conflicts with their emotional worldview, as they have internally mapped high dps to emotional fulfillment. I feel like I made much the same comment 2 months ago, if so, hopefully I said it differently enough this time to be worthwhile. One should note that the time lost because of an error shouldn't always be converted to gold/hour. If there is a risk of a raid being longer than scheduled, then the cost can be the epics that you didn't get from a boss that you couldn't kill due to lack of time. Or worse, the social/financial cost of being late to a real-life appointment. In a raiding community where the majority of members have limited time to play, it thus makes sense to be stricter than average to avoid the high costs mentioned above. Paying some repair costs and new buffs, I find a lesser evil. But wasting another 20 minutes of my 90 min. available playtime seems like a much more costly thing. That is why I'm in a guild. It saves me a lot of precious time. Overgearing tends to more slacking and stupid playing because people are over confident and don't take the challenge serious. I think the best safety margin would be to only wear the minimal required gear and therefore force people to concentrate. I think that was Nihilums safety margin when the cleared Naxx a few days after release. Quote: "Safety margin is exactly like insurance: you waste resources if everything goes smooth but you are saved from certain errors." This is true, but it also applies to finance. If you have a ton of gold sitting in your bank, you're wasting it unless you're saving up for something or will honestly come across an unexpected expense equivalent to that value. Really there is a tradeoff. Do you want your extra efforts reflected in your gear, giving you more wiggle room for error in your the runs you do or do you want more wiggle room in your spending account. While epeen can play a role in both "omg look at how much gold I have" vs. "omg look at how much dps/healing/threat I can do." However, in my experience, the possibility of having to tap into your extra "insurance" (whether it be gold or gear) comes more into play in raids/instances than it does in finance. I've wiped more times from a boss with less than 5% health than I have ever run into a financial barrier. The only thing finance has ever obstructed me from is really high vanity items (such as the motorcycle mount), but even then, I've been able to min/max my gear as much as possible and still get some luxuries such as the traveler's mammoth. Imo, as long as you can cover your repair bill and buy your consumables, there's no reason not to make sure your gear is in the best shape possible unless you KNOW you will be replacing something in the next day or so. One thing you tend to forget in your analysis is that most serious raiders (and you're not one of them, which is perfectly OK) do not measure themselves against current content (at least when it is down, which for WotLK first tiers of raiding was pretty much instantaneous), they measure themselves against *future* content. Content, you'll be quick to point out they know nothing about. But that's precisely their point : by getting all available upgrades they make sure they are as prepared as they can be. "I think that was Nihilums safety margin when the cleared Naxx a few days after release." This applies to Ensidia/Vodka/VM etc even more, even if they don't need that safety margin, do you really think they did not farm available content to exhaustion ? The fact that they cleared the extension in levelling blues/greens/SWP epics is completely anecdotical, should there have been a gap between Lich King release and release of the first raiding tier, you can be sure they would have had farmed heroics to exhaustion (and would have stormed through content even faster if that's possible). While that is probably true, It's foolish not to use the best gear available, even if it's overkill. If you have the gear, there's no extra cost involved in using it..
..unless the loss of concentration is severe enough to cause more wipes than the less-than-optimal gear. Like almost everything, it's a tradeoff that varies by guild and even by raider. Some people can maintain their effectiveness and can waltz through an instance, some stumble while attempting to do a cartwheel. Nihilum's style isn't for everyone, and the kills in suboptimal gear were probably caused by necessity (competition for world-first kills) instead of a conscious choice, just like Mahonnant pointed out. To be precise: The mage in blues you invited was "good enough" for the content because he had the skill. The guy in greens and blues who thinks he is ready in his questrewards isn't. Personally, I like clearing an instance faster and faster each week. If you're only going to do it once, it hardly matters how fast you do it. It's the difference between guilds and PuGs. If Gevlon wants to go to bed early, he can just leave his PuG raid hanging. He didn't make any kind of commitment to them. If I want to go to bed early, my guild needs to perform well, because we're not leaving until the place is cleared or the hard end time hits. There's every reason to use the gear we've got to nuke the crap out of Naxx. It pays out in RL time! But this isn't the point of Gevlon's article. The "good enough" argument only applies to his own situation as a leader of PuGs. You consider the losses of the people you're working with externalities. You say a wipe costs a few minutes and 4-6 gold- that's just for you. If I was leading a group, I'd consider the cost and multiply it by the number of people who had to pay it. I understand that as a businessman you are well within your rights to ignore the effects your leadership will have on those who follow you, but this will eventually come back to haunt you. As you alienate good players, only the desperate or morons will start volunteering for your pugs. Playing hardball (putting self above others) in the AH is one thing- the only people you hurt are other businessmen. Playing hardball with your raid is different. Even a businessman should recognize the value of "soft capital"- good will from others. Buying insurance will always be unprofitable if you use a "chance_of_error*cost_of_error > cost_of_margin" formula. They have actuaries on their side; you don't. They win if this was a zero sum game. However, it's not a zero sum game, because of the diminishing marginal utility of money (strictly speaking, it's zero-sum with regard to money, but not to utility). Your first dollar is of more utility to you than your last dollar. To your insurance company, it's all the same. Therefore, you wager money that is of less utility to you to protect money that is of more utility to you. You gain utility, while your insurance company makes money. Win-win. In game, if I lose my last dollar, that's one less trinket I can buy for my offspec. If I lose my first dollar, I lose my ability to repair. I keep a padding because money is of my money is of more utility the closer it gets to zero. Your last sentence explains why you are wrong. You value the time spent failing as the gold lost for repair bills. The repair bill is trivial. The time is worth much more than that. 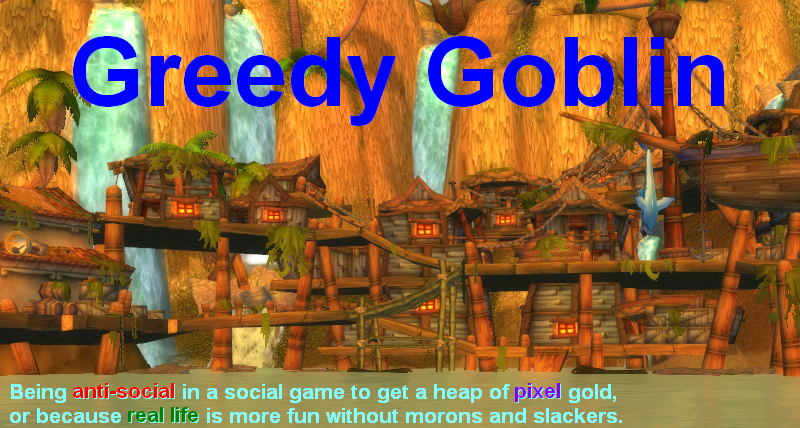 I do not know of anyone that values their time in WoW gold. If they did, it would be at a rate way higher than the repair bill per wipe. Running Naxx 10 or 25 once, in what I assume is mostly blue gear, is fine. I'm assuming that you aren't buying any epic gear off the AH because that would be "overgearing". What remains to be seen is what happens when you hit Ulduar, and even the first encounter there, where your vehicle abilities scale based on the ilevel of your gear. Gonna be harder for you going into Ulduar with ilevel 187 gear. Good luck, you're gonna need it. Eventually you are gonna hit a content level where your blue set from crafting will not get it done. You are passing on all those drops, right? After all, you wouldn't want to "overgear". If you are "good enough" for Naxx 25 what do you do next month when 3.1 comes out and you are nowhere near good enough to go to Ulduar 10? As pointed out repeatedly above, real-life time matters and the virtual worth of epics that would have dropped in a smoothly-running raid ought to be factored in. Which is why a guild run works for me. In the world of PUGs, though, you may be 100% correct. There, it may be that the time routinely lost to disconnects and having to replace bad players is so great that the time to repeatedly run back and rebuff is trivial. The time spent replacing players would be longer if you insisted on waiting for a "more than good enough" player when a "good enough" player was available immediately. Asking DPS melee to put on tanking gear is not a viable solution in your world, since you only run the instance once or twice so the accumulation of offspec loot will not occur. Once long ago, was the first time I decided to quit playing Everquest. I told my friend I thought it was a big waste of time. My friend told me, "I thought that was the idea of Everquest, to waste time.". I have thought of that viewpoint many times since then. The point of only gearing up to a point "good enough" is that you could then use more time doing something else. Maybe for you, there is something else you would rather do, and maybe there is not. You have to decide that for yourself, if you would like to use that time to make more gold, or level another character, do some RL stuff, -OR- if, in fact, you would most like to use your extra time to gear up some more and contribute to more overkill on your raiding. Maybe, in fact, gearing up more is the most enjoyable thing for you to do. But the fact that perhaps you could spend your time elsewhere is something to think about, isn't it? 1. Time lost: here you only compare time to the equivalent amount spent running dailies, why not use the amount you would've made from running some AH tricks in that same time? With your skills at playing the markets, surely that's upwards of 1 kilo gold. I think this might be more apples to apples comparison, because ostensibly you're doing this as something you enjoy (versus say farming elementals), so you need to compare time spent here to time that would otherwise be spent doing activities of similar quality (subjective measure here, and will definately vary person to person, but as long as it's self consistent, it should hold). 2. Bosses not killed. This is a scaling factor depending on how much wiping your raid does. E.g. 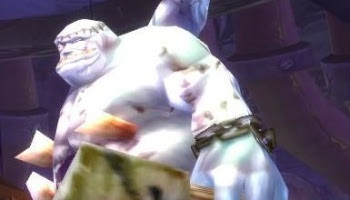 more wipes tend to constitute a quicker calling of the raid, thus more likely that any particular boss is abandoned. Attrition occurs both from people getting frustrated and real life time constraints. Though in all honesty, you can't claim more than one boss worth of loot from this (multiplied by some percentage chance of the raid being called). In 25-man boss loot is significant: 4 epics (+some gold). Also badges can count fractionally toward an epic. So (assuming epics are valued for the gear potential, basically along the lines of epic BoE drops(2k (mostly made up number))) that's maybe 10k ( including +1 epic for badges overall) worth of loot, over 25 gives 400g per raid member. 3. Raid lockouts, if you down a few easy bosses, but fail the rest, you vastly diminish your chances of getting the rest. People prefer fresh runs for pugs, and if you're up-front about having already done the easy stuff, they're even less likely to want to join. So you've essentially lost an entire week of raiding there. Which probably actually nets you gold (since raiding is largely a money sink), but does illustrate that the cost of wiping isn't necessarily just the gold, but the time lost being able to 'win' the raiding game. First time poster on this blog and i'd like to say it's fascinating. I was surprised by this, "... I would never ever play with negative safety margin: risking borrowed money"
Given your apparent business savvy I would have thought you'd know that borrowed money is the best to be using for investments. What you said is not universally correct. For someone who has sufficient funds for desired investments, there is not much difference between borrowed funds and cash on hand. For someone who does not have sufficient funds for a desired investment, borrowed funds are the only option, so I guess you could consider it a best option. Without debt, many subsequently healthy and successful companies would not have gotten off the ground, so debt is great when properly used. But to say that debt should be used for investment over cash on hand is simply not true. Either can be fine. Depending on cost of debt, sometimes cash is better. The author is probably talking about using borrowed funds for more speculative investments, which of course is the worst use of borrowed funds, because the ramifications to you are severe if the investment turns sour. Not only could you lose your principle, but you could be in the hole for the leveraged amount. This could spell financial disaster for the average person.